William Shakespeare’s history plays are not history lessons. They often swerve from real history in favor of a good story. In dramatizing the saga of 20 turbulent years in England, Shakespeare reimagines the lives of the three men who led the nation: King Richard II, King Henry IV and King Henry V. He shows his audience the power struggles and civil wars that made up their reigns, but then goes further; he reveals that “the king is but a man.” For in these plays, the political and the personal are inseparable. Shakespeare makes clear that the story of kings and their era-defining decisions and the story of clashes between cousins and fathers and sons are the same story. 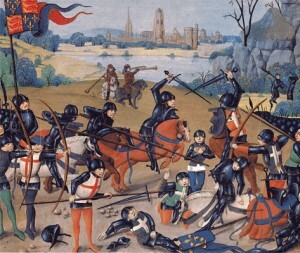 The events portrayed in Richard II and Henry V take place during the middle of an immense international family feud called the Hundred Years’ War. In 1337, enraged at the French’s seizing his territories, the young King Edward III of England decided on a bold reprisal: he claimed the throne of France for himself. After all, Edward’s grandfather and three of his uncles had been kings of France. But because Edward descended through his mother’s side, his French cousin Philip of Valois had become king instead. Now, Edward launched a full-scale invasion of his cousin’s land, routing the French in decisive battles at Crécy in 1346 and Poitiers in 1356. What began as a dispute between cousins turned into 30 years of war between nations. 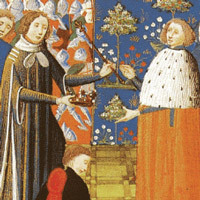 Richard II became King of England after the death of his grandfather Edward III in 1377, but family disputes also plagued his reign. Richard’s father, known as the Black Prince of Wales, had terrorized the French in battle beginning in his teenage years, and England had eagerly awaited his ascension to the throne. But the Black Prince died before he could rule, and so Richard came to power at the age of 10. Unable to escape his famous father’s shadow, he fell under the sway of influential advisors, and his uncles Thomas of Woodstock and John of Gaunt and his cousin Henry Bolingbroke stepped in to sweep away those advisors. Richard, now free to rule as he saw fit, made peace with France and war with Ireland, against the wishes of his powerful uncles. Still harboring resentment against his relatives for meddling in his government, Richard moved decisively to reclaim authority in 1397. He had his uncle Woodstock killed under shady circumstances, and banished his cousin Bolingbroke on a pretense. When Richard seized the exiled Bolingbroke’s inheritance in 1399, the furious Bolingbroke returned to England, gathered allies, and deposed his cousin. He took the throne as King Henry IV, and arranged for Richard’s death in prison. The battle of Agincourt, taken from a manuscript painted just after the event. But Henry’s rule was clouded by his violent act against his cousin, and he spent the rest of his life fighting domestic uprisings and poor health. Beginning at the age of 16, Henry’s son fought wars for (and sometimes quarreled with) his father. When Henry IV died in 1413, his son became King Henry V. He too struggled to escape his family legacy, as his father’s seizure of the throne left his own claim shaky. Both from a need to legitimize his rule and because he sensed French vulnerability, Henry reignited the war with France. With his uncle Exeter and his brother Gloucester among his most trusted generals, Henry soundly defeated his cousin King Charles VI of France. And just as family disputes first sparked the Hundred Years’ War, so they brought it to an end. After Henry V died young, his infant son Henry VI succeeded to the throne. His weakness led to power plays at home and losses abroad: by 1453, England had lost virtually all of its territory in France; that same year Henry’s cousin Richard of York challenged his right to the throne. The so-called War of the Roses split England in a horrific civil war that was to last 30 long years. Across a century of political alliances and betrayals, ambition and warfare, good kings and bad, the only constant was that the parties belonged to the same family tree.